"Eureka - I have found it!" The California state seal identifies government buildings and officials and the image of the bear is also a centerpiece for the California state flag. The symbolism, history and emblems of the seal are described in this article with fast facts and information. The shield held by Minerva displayed the head of the gorgon Medusa, who was slain by Perseus, with her petrifying power. 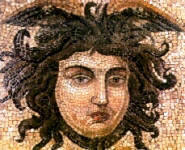 In Greek mythology Minerva changed the beautiful locks of Medusa to snakes with yellow wings on her head. The current representation of the head of Medusa on the shield is somewhat unclear. 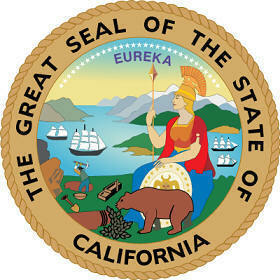 The Great seal of California is kept and used as required by the Constitution and laws of the state. This is the 1876 design of the California seal showing Minerva surrounded by many elements of today's emblems and the importance of agriculture and mining to the economy in the late 1800's. The meaning of the motto on the Seal "Eureka" alludes to the famous expression attributed to Archimedes (c. 287 BC – c. 212 BC) who shouted "Eureka!" 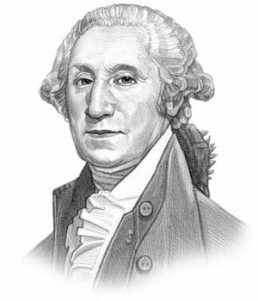 when discovered the way to measure the density of an object, and whether, or not, it was made of gold. The California motto "Eureka" refers to the discovery of gold near Sutter's Mill on January 24, 1848 and the beginning of the Californian gold rush. For additional facts refer to California Republic Timeline.